All sopranos sing music written in the treble clef, the starting point for this piece. When a singer sings, they hear the music cerebrally, then transfer that sound corporeally. The sound we hear produced is first generated by the vocal chords;. Then the body acts as a soundboard, amplifying the vibrations of the vocal chord. This painting is attempts to illustrate how this works. The singer is in full concentration, producing the music she’s hearing in her head. 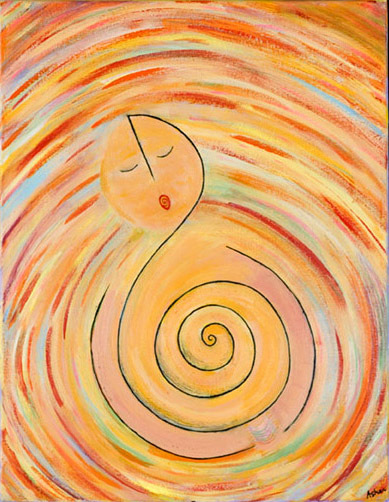 The swirls of the treble clef here are enhanced by waves of concentric arcs of color representing the sound waves flowing from the body of the performer.